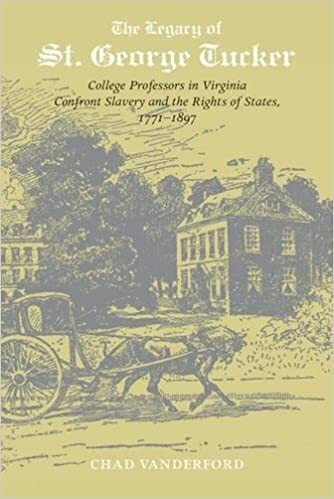 Legal History Blog: Vanderford on "The Legacy of St. George Tucker"
St. George Tucker (1752–1827), Founding Father, professor, and political theorist, saw clearly that slavery runs against the grain of the values articulated in the Declaration of Inde­pendence. Under certain narrowly construed circumstances, however, he thought it necessary to tolerate slavery. He viewed secession as an extreme step, but one that the Declaration of Independence left open as a possibility for all free states. St. George Tucker’s arguments hinged on a modern view of natural right that builds on the premise that political power can only be legitimate if it rests on the consent of the governed. He believed that equally free and independent individuals constructed a voluntary union of equally free and independent states. His son Henry Tucker (1780–1848), and grandson, John Randolph Tucker (1823–1897) sought to defend this ideology of modern natural right against fellow professors, North and South, who tended to replace it with the ancient ideology of natural right: the view that wisdom gives one the title to command. Many southern intellectuals came to believe that individuals are not equally free and independent by nature; many northerners came to argue that the states had never been equally free and independent. These disagreements contributed to the outbreak of the Civil War.